Just came across some fun traffic ticket history that I thought I would pass along! 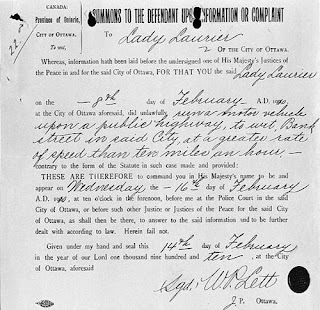 One of the earliest recorded speeding tickets ever issued was in 1910 in Ottawa to Lady Laurier (wife of Sir Wilfred Laurier, Prime Minister of Canada) for driving her vehicle at the speed of just over 10 miles an hour. That is the equivalent to a mere 16 km/hr! This is a picture of the actual traffic ticket, but I haven’t been able to find any information stating what happened on her court date, or if she decided to pay the fine. Either way, I would love to know what the fine amount would have been for driving 16km/hr in 1910!